Don’t tease the velvet ants in Sulphur | Where to next? Poor John and Joy at the Vendome Well in Flower Park in Sulphur. There are a lot of ways to get from Dallas Texas to Tulsa Oklahoma. Given that we like to do a lot of our travels overland, we decided to take the bus. It also gave us an easy and reasonably quick way (about three hours) to get to Sulphur, in south central Oklahoma, to visit long-time friend, Joy. The bus only goes near to Sulphur, so Joy met us in Pauls Valley and drove us the last 30 miles. Joy has lived in Sulphur since at least the 1990s, and I was delighted to discover that the town has a lot more going for it than I had ever realised. For starters, it is home to the Oklahoma School for the Deaf. I suppose the name Sulphur should have been a clue to the other big drawcard. 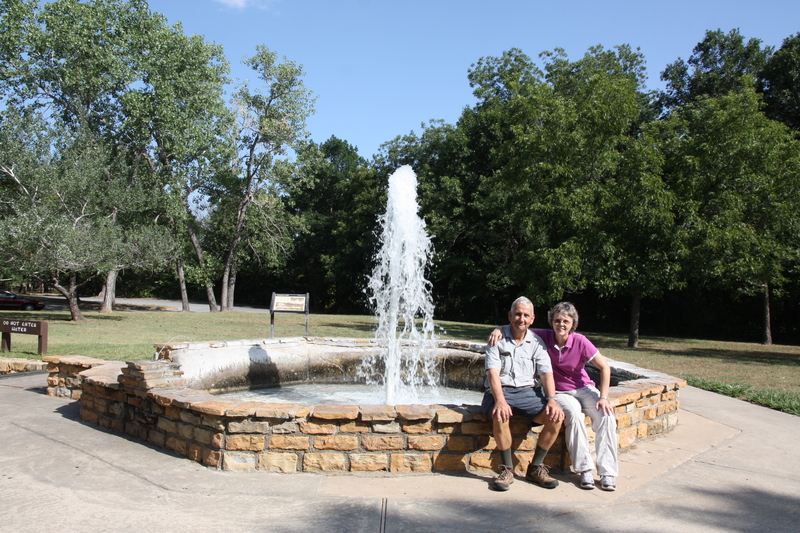 The picturesque Chickasaw National Recreation Area has a collection of mineral springs that were once thought to cure a whole range of medical conditions. 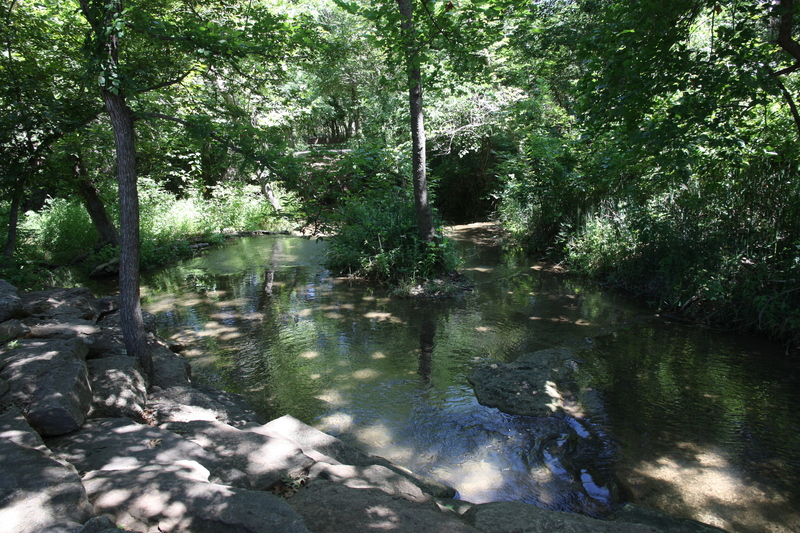 A picturesque sport in Chickasaw National Recreation Area. Can’t say I liked the smell or taste of the water, but I splashed some on my personal array of bug bites (soothing and refreshing) and twisted knee (did nothing). The recreation area is lovely and very popular. It gets 3 to 4 million visitors a year who come to hike, swim, fish, motorboat, ski, sail, camp and more. We arrived in the late afternoon, so had most of the place to ourselves. We saw a couple of great swimming holes and took a longish but very easy walk. If you’re lucky, you might even glimpse some buffalos, but they were hiding when we were there. The next day we visited the Travertine Nature Center, which is also part of the recreation area. The information there solved a big question from us. Earlier we’d seen an exotic looking, fuzzy, ant-like bug. 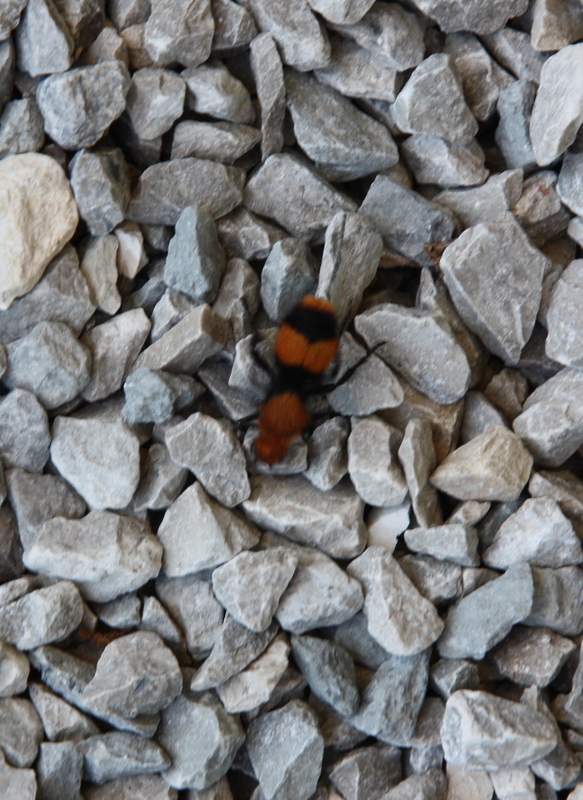 Turns out it was a hairy wasp that is called a velvet ant. The wingless female velvet ant is more than a little vicious. Her sting is supposedly strong enough to kill a cow. Glad we didn’t tease the one we saw in Joy’s driveway. Thanks for sharing about your visit to Sulphur. I enjoyed your visit, and you getting to meet my sister Jill and her husband Truman. When I talked to my friends about your visit, they asked, “Did you show them the Chickasaw Cultural Center?” It’s our newest tourist attraction. The Center has Chickasaw Indian Exhibits, an Indian Village, and Chickasaw Events throughout the year. Sorry we didn’t make it to the Center. I haven’t toured it, either. Remember the Lincoln Bridge we walked across in the park? It was featured on the U.S. National Parks Quarter circulated in 2011. Hope to visit Canberra again. Jill wants to come with me. We had such a wonderful time in Sulphur—thanks for such an amazing bonus stop. Guess we’ll have to come back to see the Cultural Center. We’ll be expecting you and Jill whenever you get to Canberra. Yes, you WILL have to come back to the see the Cultural Center! You were 145 miles from my son’s home in South Tulsa. We’re hoarding our last few Tim Tams as I type & send lots of love to you & “Saint John”. Miss you both! Lots of love back to you both. I need to figure out how to get more TimTams to you.